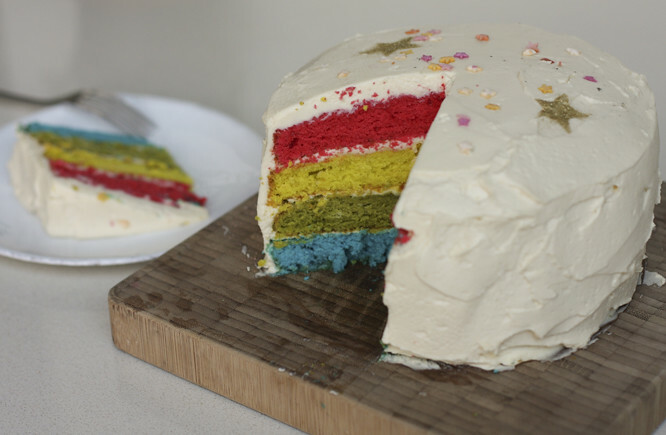 Last Thursday I was having dinner with a couple of friends when I confessed my intention to make a rainbow cake the following morning (having already spent money on cake tins and food dye I was pretty committed to the task). "Are you mad / Haven't you got better things to do / Why bother"
It was a two-week late cake for Hugh's birthday - I think both him and Coco were put out by the lack of cake. For a three year old birthdays are all about the cake. And a little bit for Hugh's sister who was visiting and had also had a birthday. But mainly I guess I'd set my mind to doing it. There is something about making things that just makes me feel happy and satisfied. I'm not normally a baker, but having a contained project (unlike most of my schemes) is quite a good thing once in a while. And the result of both making the cake and the prospect of surprising Hugh and Coco was actually very enjoyable. Rocking the pushchair to get Henry asleep at the same time as trying to ice the thing was a little stressful, but generally, it was kind of fun. 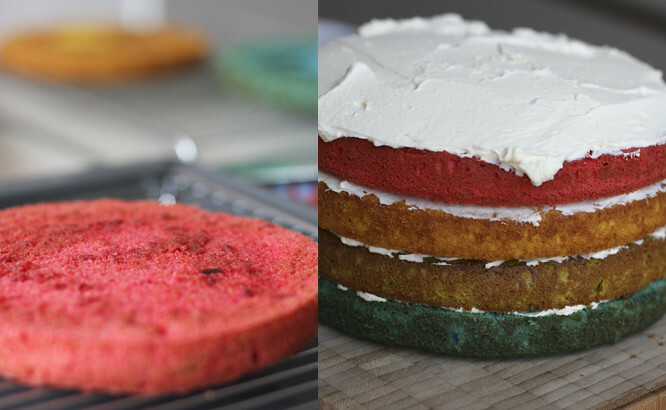 And one of the secrets, I discovered, to making baking fun is don't clear up along the way. Because I had to do the whole job by 1.30 I just measured and mixed, messed with food colouring and shoved the dirty dishes in the sink, left wafts of flour and dribbles of egg until it was done. In a slightly obsessive way I normally HAVE to clear up as I go along. My theory for what it's worth! I didn't go crazy with the layers, or try a complicated icing; so I think I was pretty sane about the whole project really. And the cake did it's wowing job perfectly. Coco of course only ate the red/pink layer despite taking part in a blind tasting which proved that all the layers tasted exactly the same! Ms Marmite Lover has done a UK version of the recipe, which I followed and which worked a treat. The original US version can be found on Whisk Kid. I just found your blog and love it. I love the letters you made for Colette and this cake is amazing. I love baking fancy cakes too! I usually do that in the middle of the night while everybody is alseep. I have a baby too and I feel the same as you about wanting to achieve things here and there. I'll come back to read more from you.